Jenny Campbell has been a freelance cartoonist and children’s illustrator for 25 years. And, for the past 11 of those years, has created “Flo & Friends” for Creators Syndicate, a daily and Sunday strip focusing on an ensemble cast of senior citizens who try very hard not to take life, and aging, very seriously. The strip is becoming increasingly more autobiographical. Jenny herself also tries not to take life very seriously, and her hobbies, in addition to tennis and bicycling, also include wine and laughter. In addition to the cartoon strip, Jenny has also been a prolific children’s book illustrator, with more than 17 books to her credit. She is currently at work on her first digital children’s book, and a 500-page cookbook, both slated for publication in late 2012 or early 2013. Among Jenny’s other titles are four of eight books written by Sandra Philipson, for Philipson’s popular “Max and Annie” children’s series; “Zachary Z. Packrat and his Amazing Collections”, authored by Brooke Bessesen and published by Arizona Highways Books; and six books for Canadian children’s author Tina Powell. Jenny also is a prolific (pro bono) illustrator for Rescue Village, Geauga County (OH)’s Humane Society, producing all of the artwork for its newsletters and appeals, and donating scores of paintings and prints for fund-raisers. In addition, Jenny has created artwork for other animal welfare organizations across the country, and her characters grace not only the state of Ohio’s specialty “Pet Plate” license plate, but also the sides of mobile spay-neuter vans for PetFix Northeast Ohio and the ASPCA. Jenny’s other works include literally hundreds of K-5 textbooks for every major publisher, and a myriad of other children’s publications, as well. The most notable of those is Highlights for Children magazine, for which she’s been a monthly contributor for more than 10 years. She also is a popular speaker, who often takes her interactive art and literacy program to schools and libraries throughout the Midwest, and occasionally nationwide. Before she became a fulltime illustrator, Jenny was an award-winning newspaper writer for 13 years for The Arizona Republic, and then The Orange County Register in Southern California. Following in her father’s footsteps, she was a sixth-generation journalist when she graduated from Arizona State University with a BA in journalism in ‘79. 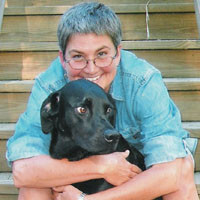 Jenny lives in Chagrin Falls, Ohio, in an 1880 farmhouse with Theia, a 75-pound cross-eyed black lab mix with issues; Matthew, a 16-year-old black tomcat with diabetes; and her 85-year-old mother, an artist and former PR executive, who realizes that Jenny is using her for research for her cartoon strip, but she seems okay with it.